First Line: He was sleeping so soundly that not even cannon fire could have woken him. 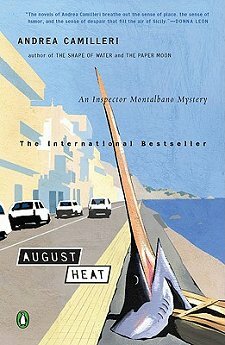 One of Inspector Montalbano's co-workers has extended his summer vacation, forcing Salvo to stay home and endure the August heat. Livia, Montalbano's girlfriend, joins him, bringing along a friend and the friend's husband and young son. Montalbano finds them a place on the beach and looks forward to lazy days at the office and lots of quality time with Livia. Unfortunately the house he found for the family to rent turns out to be a horror of biblical proportions-- with plagues of cockroaches, mice, spiders, and rain. The rain causes the ground to settle and a huge fissure to form. The couple's young boy goes exploring, gets caught down in the fissure and must be rescued. During the rescue, the body of a young girl is found. When Montalbano focuses on the the murder, Livia takes her friends and leaves Montalbano to his own devices. After the first few hours, I don't think he missed any of them. Once again, Montalbano seems intent on his own mortality. August Heat shows him at times lethargic, at times lustful, as he tracks down leads and interviews people. Most of the humor is in the first quarter of the book, and while I learned a lot about the building codes and construction companies of Sicily, the alibi of one of the main suspects was all too easily picked apart. Montalbano's gloom over the fact of his aging and his being led astray-- once again-- by a pretty woman is becoming tiresome old news. This is definitely not one of the best books in the series, but that's okay. A less than stellar outing by Andrea Camilleri is still miles above many other authors in the genre. He has created a landscape we can see, food that we can smell and taste, and people that we have come to care about as if they are members of our own families. Not every day is perfect for any person, real or imagined. It was August. It was miserably hot. It just wasn't one of Montalbano's better investigations. But a new day-- and new books-- are just over the horizon. August Heat at The Book Depository. August Heat at Your Favorite Indie Bookseller. I haven't read this one yet. I have liked to ones I've read. Montalbano's personality reminds me of my Sicilian-American father's personality. I read the latest of the Montalbano books (which I liked). I have to wonder if Camilleri himself is getting tired and the books reflect that. Did I read somewhere that he is 90? Cathy - I really, really like this series, so I am so glad you highlighted this novel! There are, admittedly, things I'm not crazy about and I do think the early novels in the series are better. But like you, I think this one is "not his greatest but still pretty good." Sometimes I wonder why he stays with Livia. She was really nasty to him in this one. This wasn't one of the better books. Have you noticed yet that most of them, if not all, start with Montalbano in bed, usually asleep, sometimes in a really bizarre dream? Joe-- I've liked them all except for the first one. This one just isn't quite up to the standards of the others. But, if the man isn't 90 he's getting very close! Margot-- Camilleri's got me hooked. I'd hate to see what it would take for me to stop reading the series. Pepper-- I'm not a fan of Livia. She could completely disappear from the books and I wouldn't bat an eye. Yes... I have noticed that!